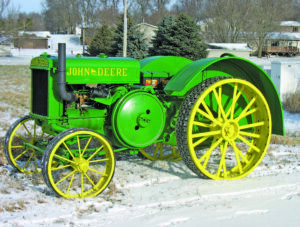 After restoring our family’s 1930 John Deere “D,” my brother and I decided that we would like to look into converting it to electric start. WE would like to be able to drive it, even after we get too old to hand crank it. We had heard all about them being easy to start “if everything is tuned up correctly.” We found out that that is not always the case and that it could be a real handful to crank. 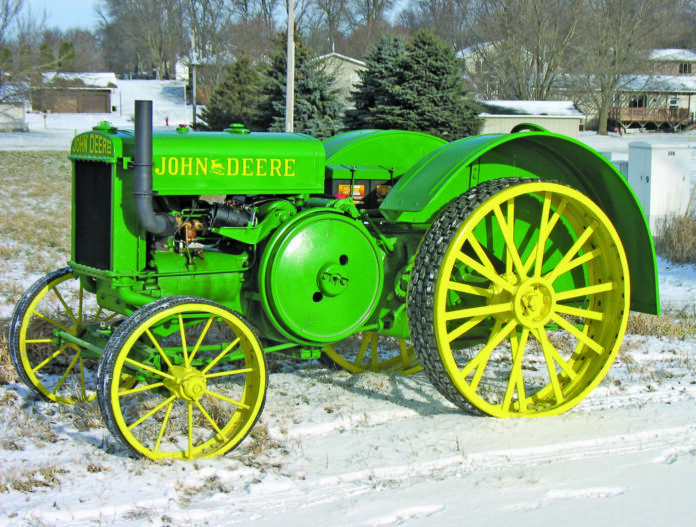 We contacted a gentleman near Worthington, Minnesota who was parting out many two cylinder John Deeres, including a styled “D” with electric start. A deal was struck and we brought home a starter, mounting plate and a flywheel with ring gear. We had been told that the “D” engine, after 1930, was balanced differently and the styled flywheel might damage our engine, or at least cause it to vibrate. Others said it might not make any difference. We needed to find out for ourselves. After removing our flywheel, we found that the styled one fit perfectly. 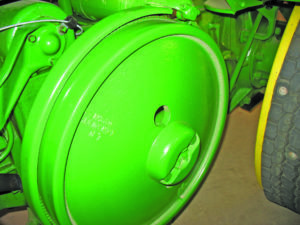 Upon pull starting the tractor, we found that the styled flywheel definitely did cause a noticeable vibration. We ran her back into the shop and shut her down. Our original flywheel would need to be used. Since reproduction ring gears for “Ds” don’t seem to exist, we drove the ring gear off the styled flywheel and flipped it over, so a fresh edge would meet the starter drive. A local farm shop, with a large lathe, cut a groove into our flywheel and press fit the ring gear onto it. Although the ring gear is about one inch wide, it should only be driven on about half an inch to line it up with the starter. The styled “D” starter mounting plate does, indeed, bolt down onto the 1930 “D” but it needs to be cut out to allow clearance for the “red head” oil pressure indicator. After a local machine shop took care of that, we decided to add a gusset to the starter plate as the cutout looked like it would weaken it and the “D” starter is very large and very heavy. 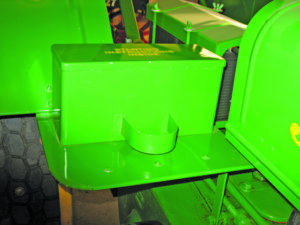 The red head gauge will contact the bottom of the starter when the engine is running, but that doesn’t seem to cause any problem and it is still visible from the driver’s seat. As the oil filler pipe departed with the old crankcase cover, a new hole was drilled into the starter mounting plate and a pipe, with a cap, was fitted to it for an oil filler. Our tool box also departed with the old cover, so we relocated it to the belt pulley guard. Our used starter was sent out to a local rebuild shop and found to need only a good cleaning and a bushing. We bought a reproduction battery tray and cover for a styled “D” and mounted two new six volt batteries wired for 12 volts, positive ground, and found that this setup spins the starter very well. 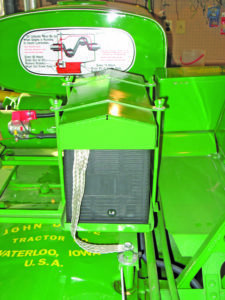 Wanting to start the tractor from the driver’s seat, we routed a choke cable back toward the throttle lever and mounted a foot operated starter switch on the mud guard, near right right side fender. 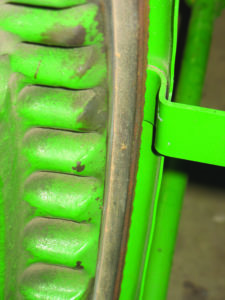 A reproduction flywheel guard was mounted around the flywheel, with slight modifications to the mounting brackets and a crank ratchet was bolted to the center of the flywheel, just to make it look proper. We now find no need to open the petcocks to crank and it sure is nice to be able to start the tractor from the driver’s seat. We don’t miss hand cranking it at all and it has become quite a conversation piece at shows. We are now in the process of adding a charging system, but that is a subject for a future article. What do you say now, Mr. Thinker? 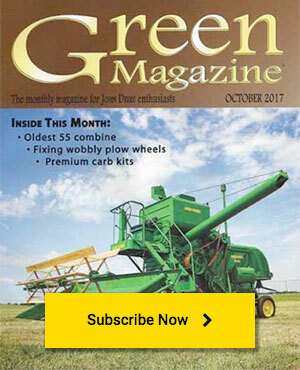 Next articleA Really Big John Deere Plow.